The Tulip Festival Parade, May 15, 1965. Image: Ted Grant / LAC Accession 1981-181 NPC Series 65-0151 Image 92. Recently, while I was researching the Stephen(s) Block facade at Bank and Sparks, I had noticed that among the photographs taken in the area, it did not figure prominently in the various available collections. Photographers appear to have found the Sun Life building across the street to be much more attractive on the whole. 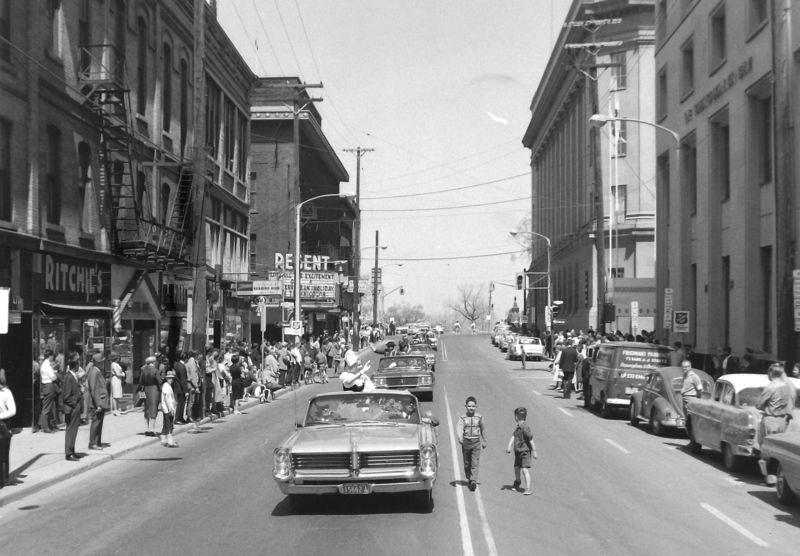 While searching through some of the shots taken by the great Ted Grant that I have collected over the years, I rediscovered this one taken during the 1965 Tulip Festival parade. I think it gives a bit of a better idea about the nature of the streetscape at Bank and Sparks during the 1960s. An approximation of the view in 2015. Image: Google Maps, May 2015.